So many times I take photos and forget to post them here! You can see from the sunshine in these that it is most definitely not this time of year! These were taken at one of our favourite local places to visit 'Elgoods Brewery Gardens'. The first one is of a little bridge that goes over a little waterfall that feeds into the small lake to the right of it. This is one of my favourite trees there. It's absolutely beautiful. Can you tell I love trees?! 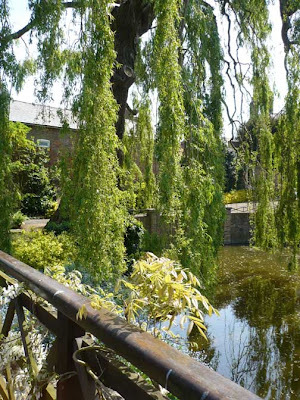 This is the weeping willow hanging over the bridge and also trailing into the water. The tree was much denser, but we had really high winds and it vastly reduced it. Not sure what kind of tree this is. Possibly some kind of fir. 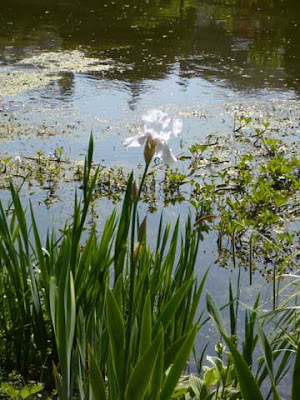 This white lily was almost directly in front of us, bobbing in the sunshine as we sat on the bench overlooking the lake. Here's my Robert! 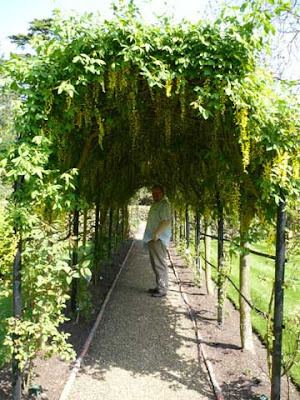 Underneath the laburnum trailing the arch. It's hard to believe we will have heat and sunshine like this again! I remember sitting on the bench with my scalp slowing cooking. Roberts hair isn't as lush as it used to be so I think he was slowly cooking at a higher temperature. He'll love me for saying that. I'm still working on my website. I'm at the point now when I will be very glad when it is done. So of course, what have I been doing rather than work on it? Visiting blogs of course! I made this little birthday cake yesterday for my partners niece. You really need to look at your hand and then at the photo again because otherwise its hard to get the scale! I hope it tastes ok! It was made using three of my chooks eggs. It's not often I make a cake because my eggs are so popular they tend to be put aside for people to buy! I'm still busy redesigning my website with a whole new look. It's takes so long for me to decide how I want it to look! Then of course theres making sure everything uploads and works ok.